Eric Pollitt Marketing & Design Group is dedicated to helping our business clients leverage the power of the Internet by providing a comprehensive solution to all your Internet needs along with the expertise and skills to successfully implement your ventures online. Internet based technologies and rapid development cycles have changed the way in which businesses communicate with their staff, their partners and their customers. Our aim is to take existing business systems and cost effectively integrate them with the Internet — to empower your customers, partners and employees and to reduce costs for you. Extending the lifetime value of your IT investment by linking various disparate systems via one common user interface — the Web browser — and making it the standard interface for all new applications ensures that your existing technology environments can be integrated with the new. By developing your Internet applications in technology that is reuseable across different platforms, we ensure that your business can easily take advantage of each new trend and technological breakthrough the future holds. 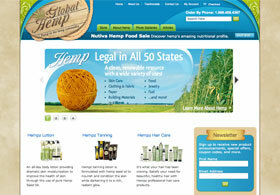 This website provides valuable information for those interested in learning more about industrial hemp.